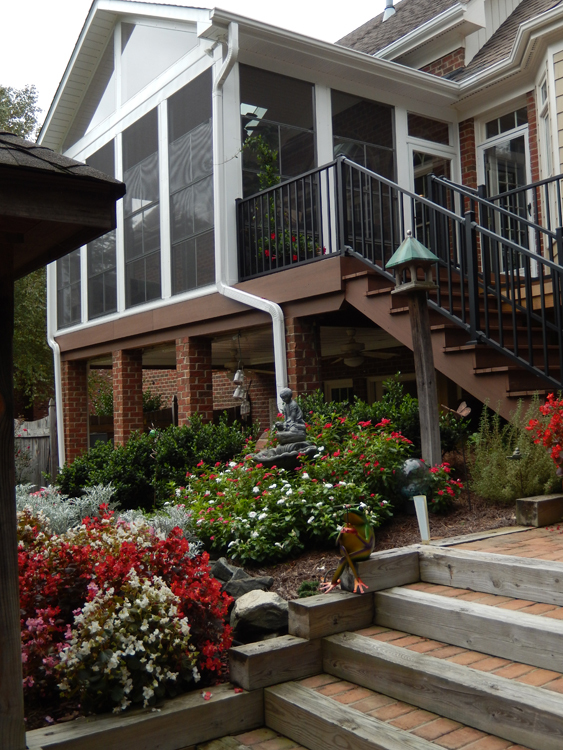 Archadeck of the Piedmont Triad has been building decks, porches, pergolas, docks, patios and 3-season rooms in this area since 1991. Since then, we’ve built second, third and even fourth jobs for local area homeowners. As you can see in the images below, each job is custom-designed for the individual homeowners to fit their taste and to work with the existing home. We take special care to ensure your new space looks original to your home. The job above includes an Eze-Breeze 3-season room and a TimberTech composite deck. Take a look at the beautiful streaking pattern on the TimberTech deck boards. Also notice how well the decking color complements the rich brick tones of the home’s facade. In the forefront of the photo, you’ll see parting boards. 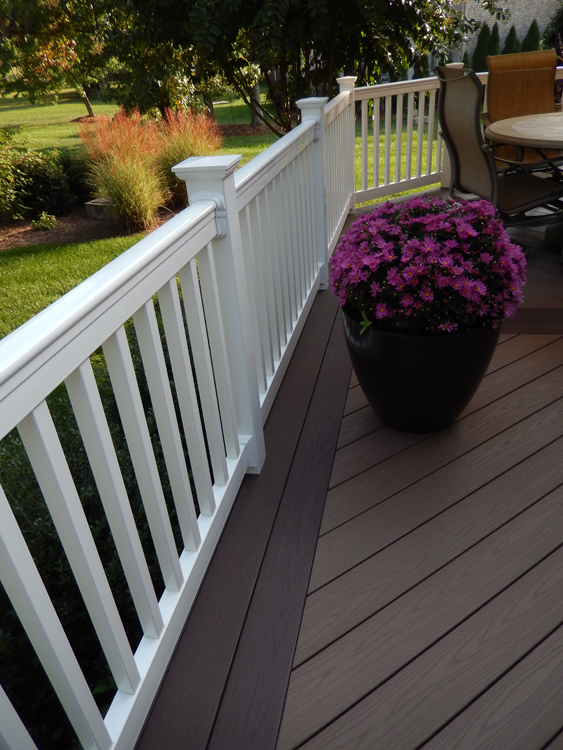 When a deck is longer than the span of decking boards, a design featuring using parting boards is used in upscale decks. Not only does it accomplish the objective of not butting boards together but it also gives tremendous aesthetic appeal to the job. 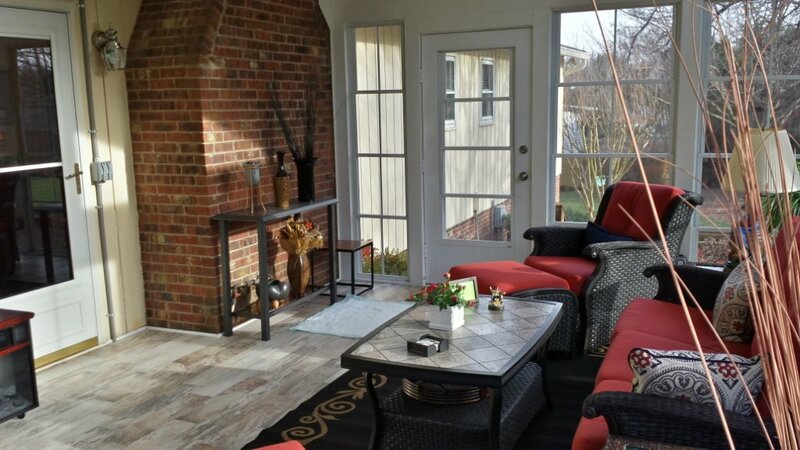 The porch includes the Eze-Breeze 4-track vinyl window system allowing these homeowners to open their windows up to 75% or to close the screened portion completely as the temperature drops. Above is a beautiful 3-season room and grill deck in Bermuda Run. This picture is always one of our most popular pictures and there are many reasons why. Every design detail was attended to from the brick wrapped posts to the matching gutters and soffits and everything in between. You may not notice it in this picture but a small grill deck was added between the house and the stairs. You can see that the living level is quite elevated from the backyard which is why this porch and deck are elevated. The homeowners didn’t want to have the grill chef down in the yard when the family and guests were up on the next level. 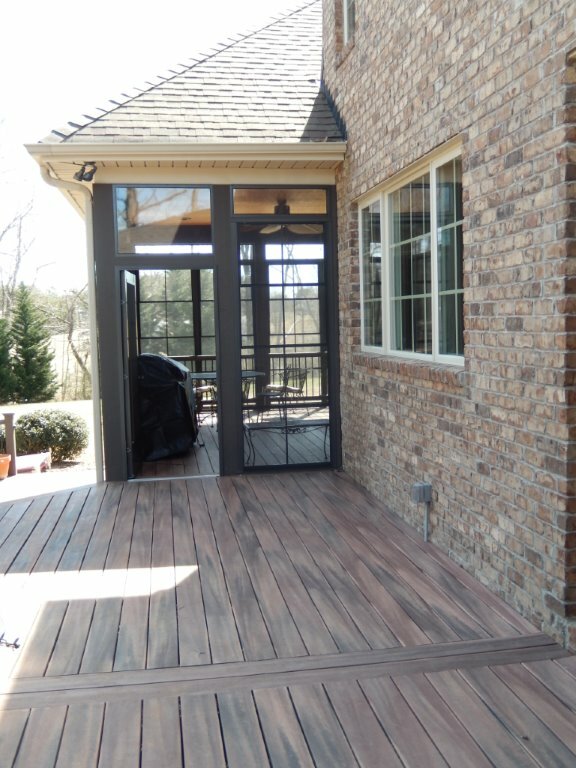 Since a grill cannot be utilized inside a porch, we built a deck to accommodate the grill. Not only is there easy access to the porch, but there is also easy access to the kitchen to transfer food and grilling implements from the house. The screened porch above is in Clemmons NC. Notice the way the porch is designed to work with the architectural features of the back of the home – namely the brick fireplace. The fireplace is integrated into the design of the porch. This space is spacious and filled with light. Give us a call to discuss adding an outdoor living space to your home. Call (336) 664-1332, email us or fill out the form on this page. Every Archadeck project is custom designed and built. 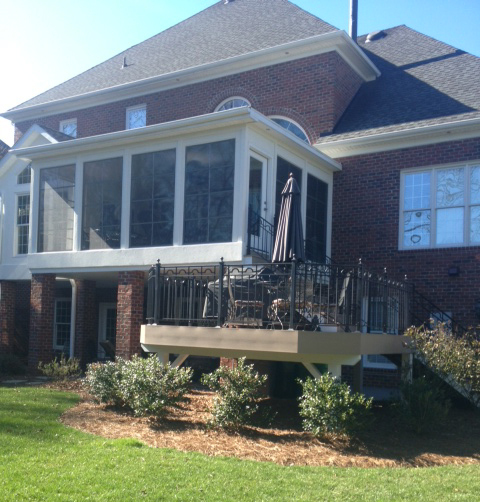 The 3-season sunroom and deck above have beautiful custom details. The first thing you may notice is that the 3-season room has a flat roof. When we work with you to determine the design of your new room, we look at the site conditions of your home. A challenge in determining the roof style of a new room is whether there are second-story windows or other second-story architectural details that we don’t want to cover with a roof. Since there are numerous second-story windows, we selected a flat roof design. Please note that a flat roof design is never actually flat. A slight pitch is designed in to ensure proper draining from the roof into the gutter system. It’s difficult to see here but the roofline is elevated to ensure a very bright and airy look and feel within the room. The step-down deck has a beautiful and unique look and shape. Notice the wrought iron railings! Many of the homeowners we work with have pets. Often, taking the pets’ needs and lifestyle into consideration is a key part of the design process. You may have older pets that need a landing in the stairs so they can easily get outside. You may want a doggie door for your porch or a doggie gate for your deck. Let us know the design features that all of your family members need and want and we will integrate those features into your custom design and build. 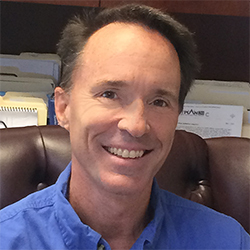 We have a number of amazing lakes here in the Piedmont Triad including Lasater Lake, Salem Lake, Crystal Lake, Winston Lake, Shattalon Lake, Lake Higgins, Sedgefield Lake, Lake Brandt and a number of others. 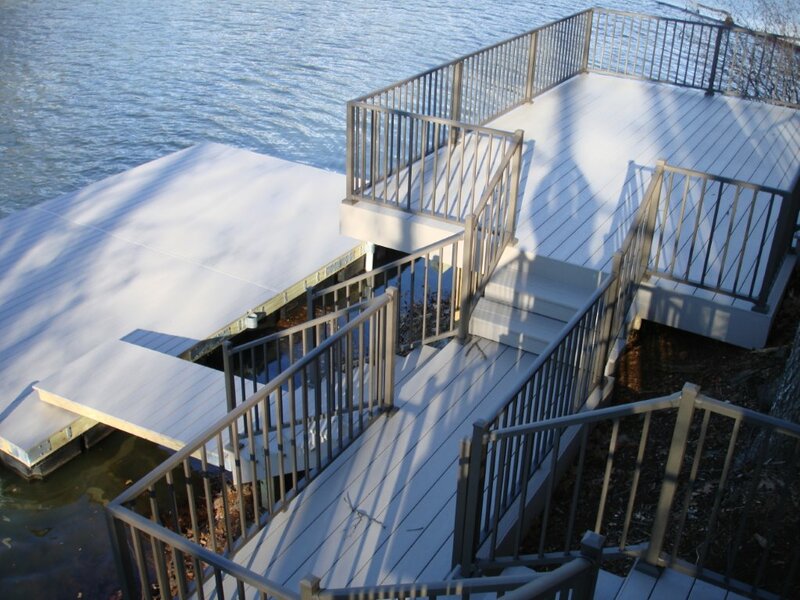 If your property has lake access, you want your access area to be functional as well as beautiful. Local area homeowners looking for a dock often want a multi-level dock. The lake access level is functional while the congregating and recreating area is often large to accommodate seating and sometimes sun protection. 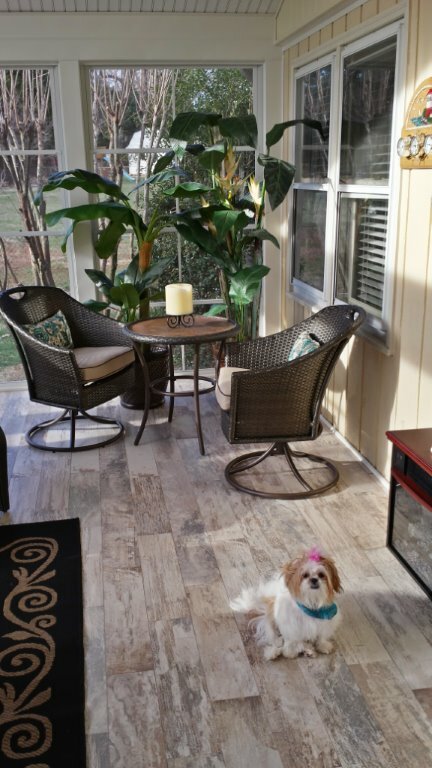 This family also had us add an open porch in the adjacent yard to give them plenty of options for full-sun and partial sun outdoor living enjoyment. 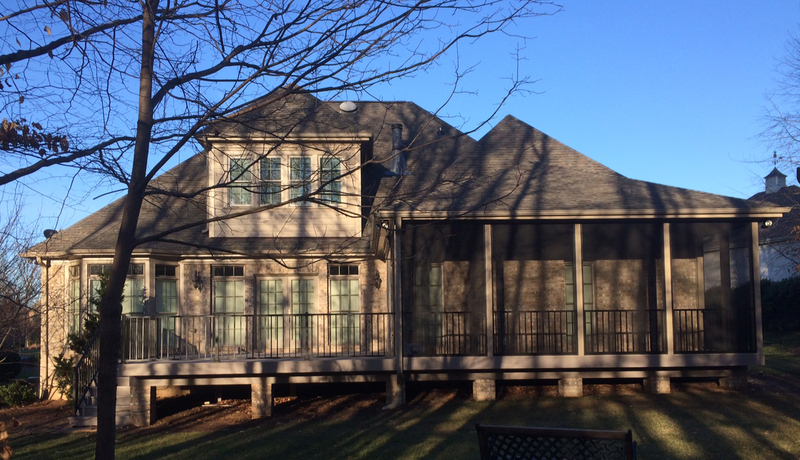 The back of this beautiful home in Bermuda Run Country Club was completely transformed with the addition of this large hip roof screened porch. As you can see, the home has a couple of hip roof rooflines so we designed the porch roof to match. The porch includes wide screened openings and a slender profile picket black railing to ensure maximum visibility into the backyard.